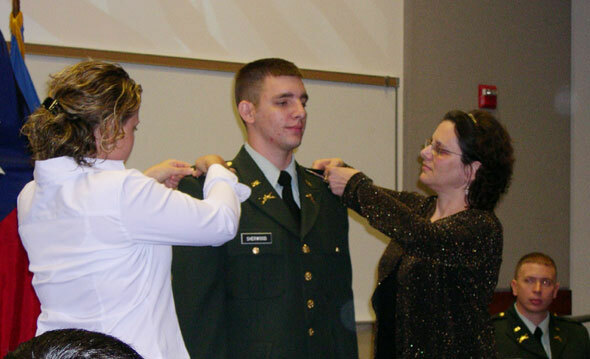 Top: Newly-commissioned 2nd Lt. William M. Gensert (far right) looks on as 2nd Lt. Christopher E. J. Sherwood receives his officer pins from his mom and girlfriend at the winter commissioning ceremony, hosted by the military science department Friday afternoon. Sherwood will receive is bachelor's degree in history at Saturday's commencement ceremony and is scheduled to report to the Armor Officer Basic Course at Fort Knox, Ky., on Feb. 14, 2005. Right: Gensert is administered the "Oath of Office" by Lt. Col. Alan Mooneyham during the ceremony. He will receive his master's degree in criminal justice and criminology at Saturday's commencement ceremony and will attend Armor Officer Basic Course at Fort Knox, Ky., in Feb. 2005. 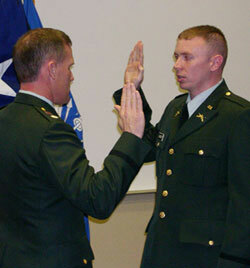 In addition, Gensert has received a branch assignment to military intelligence with his branch detail (armor).